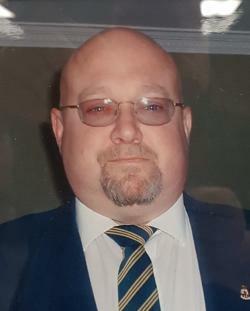 Allan L. Saunders (Big Al), 62, of Petitcodiac, passed away at home on Friday, March 15, 2019. Born in Moncton, he was the son of Bertha (Cain) and the late Robert Saunders (2010). Allan graduated from Petitcodiac Regional High School in 1976 and worked at New Brunswick Liquor Corporation for 27 years. He coached numerous ball and hockey teams and was instrumental in getting the lights in the ball field. He was past president and executive member of the Royal Canadian Legion Branch #41 and organizer of the Westmoreland County Agricultural Fair Bonanza Night. He was a member of the Petitcodiac Baptist Church and enjoyed playing 200, crib and darts. In addition to his mother, he is survived and sadly missed by his beloved wife, Susan (Drury); sons, Colby and Colin; canine companion, Molly; Godchildren, Rebecca and Liam; siblings, David (Lorie), Debbie, Michael (Marlene) Susan (Mark), Peter (June), and Brian; several aunts, uncles, cousins, nieces, nephews and many good friends. Besides his father, he was predeceased by uncles, Allan Saunders, and Buddy Renton; aunt and uncle, Lois (Joe) Nugent; mother and father-in-law, Les and Ethel Drury; brothers-in-law, Peter Drury and Greg Ogilvie. Resting at Salisbury Funeral Home, 3350 Route 106 (372-4800) from where visitation will take place Sunday, March 17, 2019 from 2 – 4 and 7 – 9 pm with Petitcodiac Fire Department presenting an Honour Guard at 3:45 pm and the Royal Canadian Legion Branch 41 holding a tribute service at 6:45 pm. Funeral Service will be held at the Petitcodiac Baptist Church on Monday, March 18, 2019 at 11 am with Rev. Robert MacDonald officiating. Interment in Maplewood Cemetery in the spring. If desired, memorials to the Petitcodiac Fire Department, Petitcodiac Baptist Church, or Friends of the Moncton Hospital would be appreciated by the family.